TWO people have been taken to hospital with minor injuries and up to 30 houses in Lennox Head have sustained serious damage after a mini-tornado ripped through the seaside village at about 7.30am. Power lines are down and an electrical transformer exploded requiring the HAZMAT team to be scrambled to clean-up oil and other hazardous debris. There have been a number of people injured who are being treated by NSW Ambulance personnel. The State Emergency Service (SES) has said the powerful storm was likely to be just the first of many. "This is just the entree," a State Emergency Service spokesman said. More waterspouts and violent thunderstorms are likely to leave a trail of destruction through Thursday as the deep low pressure trough which caused the Lennox Head twister moves south, he said. One of the worst hit houses was Trevor Hickey's in Stewart Street. The first floor of Mr Hickey's four-year-old 'dream house' was ripped off by the tornado. Mr Hickey described how he grabbed his wife and took shelter under a blanket on the floor as their house disintegrated around them. The caravan park was also hard-hit. Several vans were up-ended, but it was fortunate that many of them were unoccupied at the time. Lennox Head residents have rallied to the cause. Many people are out in the streets helping their neighbours in the worst affected areas to clean up. An evacuation centre has been set up at the Sports and Recreation Club, Lennox Head, for residents requiring temporary accommodation. Police ask all residents to stay away from the area as it is considered dangerous due to loose debris and power lines across roadways. Police ask residents in Northern NSW to take precautions and follow all storm warnings in the region. Emergency services said the picture remained unclear with numerous calls for help from residents in the area. 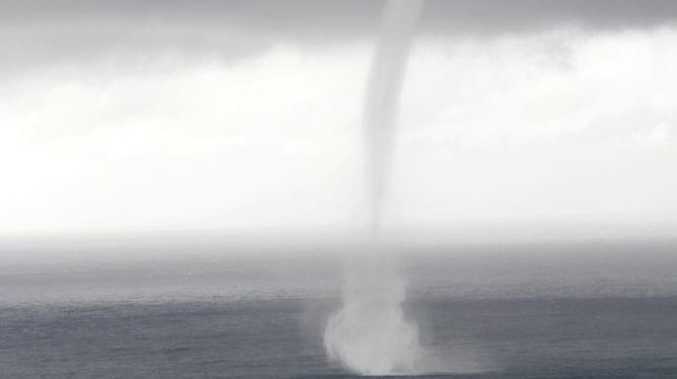 Police inspector Shane Dean said he could see "mini tornadoes" off the Lennox Head coast. "As I look out at the ocean you can actually see what I'd describe as mini tornadoes out to sea," he told Seven. "It sounded like a jet was coming in to land on our house," Lennox Head resident Andy Brown told the ABC. "The spiralling of the material just being ripped out the roofs as you would see in a tornado in America but just on a smaller scale. "(There were) sheets of roofing spinning into the air and anything else that it can pick up. "It's hard to explain, a friend of ours has been injured and they can't get out, no ambulances can get in because of the powerlines." Anna Dicker, owner of a Lennox Head Hostel, said there was widespread damage. "It was pretty bad. There's several houses in our vicinity who've lost their roofs, their windows, a lot of damage from flying debris," she told Fairfax Radio Network. "The power pole's bent, there's caravans on top of caravans ... debris everywhere, it's unbelievable. "I just heard this huge bang. We sustained a bit of damage to our courtyard roof and I thought that was it until I walked outside and saw the rest of it." Dave McGuiness whose local business, the Lennox Head Bakery, was missed by the storm said it was "chaos". The roof was torn off the local pub and it had been destroyed, he told the Nine Network. "It ripped the caravan park to shreds," he said, and only about four caravans were still standing. About a dozen homes had their roofs torn off while numerous others had smashed windows and other damage, the SES said. They have urged people to stay away from the affected areas, one of the worst being the main street, Pacific Parade, which runs between the beach and the town. The Bureau of Meteorology said the waterspout was caused by an area of deep low pressure which has been moving down the northern NSW coast since Wednesday night.